Bodanzky was born in Vienna in 1877, studied at the Conservatory there, and joined the Vienna Court Opera Orchestra as a violinist during Mahler’s reign as music director. He later became an assistant to (and friend of) the composer, and held conducting posts in Prague and Mannheim before the outbreak of the First World War. In 1915, upon a recommendation from Busoni, Toscanini hired him for the Metropolitan Opera in New York. He went on to head the German wing there until his death in 1939. Bodanzky’s first recordings were made in 1918 for Columbia with the Metropolitan Opera Orchestra. Probably due to the virulently anti-German feeling in America during the First World War, the selections focused on orchestral excerpts from French and Italian operas. Two years later, Bodanzky recorded several sides for Pathé with the New Symphony Orchestra, an ensemble which soon after was absorbed by the New York Philharmonic. Between 1920 and 1925, he made an extensive series of piano roll recordings for Ampico, conducting duo-pianists (including Arthur Loesser and future Met conductor Wilfred Pelletier) in symphonic repertoire, including complete versions of the Beethoven Fifth, Schubert “Unfinished” and Dvořák “New World” symphonies, as well as overtures and short works. The final and most important series of commercial disc recordings Bodanzky undertook were made in Berlin for the Lindström labels, Odeon and Parlophon, between 1927 and 1929. The ensemble was composed of members of the Berlin State Opera Orchestra, and the repertoire centered on German and French opera and operetta overtures, waltzes and short works. 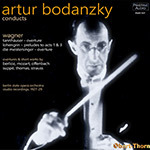 Bodanzky’s complete commercial recordings of Wagner, which are presented here in their entirety, come from these sessions. Throughout, the hallmarks of Bodanzky’s approach – generally rapid tempi and tight ensemble playing – are as apparent here as in his much-admired Met broadcasts.